One of the UK's most popular evergreen shrubs. Spectacular evergreen red foliage, that looks good all year. Easy to grow and will do well in all gardens. Perfect for patio planters, garden beds and borders or used as a low informal hedge. New growth is really colourful, being bright red. Photinia 'Little Red Robin' is a compact version of the well know Red Robin variety, and only grows to around 1 metre tall. 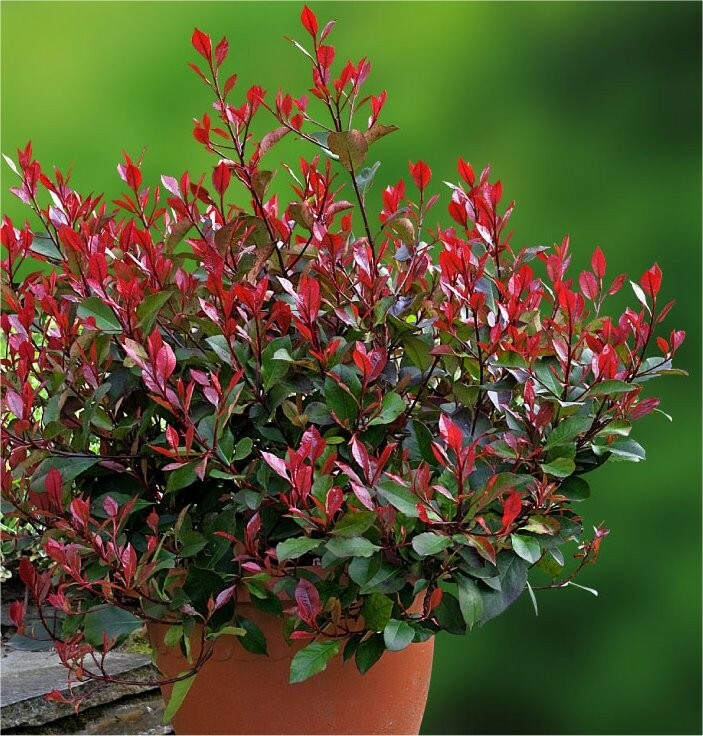 The foliage is smaller and in good proportion to the size of the plant, the colour of the young foliage is, if anything, even better than a regular 'Red Robin' with a really strong red shining through. This compact plant is perfect for garden structure and summer colour, in even the smallest garden. You'll think of many different position in which to try this fantastic variety. Why not display in patio planters or perhaps try upto 3 plants per metre and use it as a low informal hedge? High Quality Plant are Supplied in approx 1 litre containers.